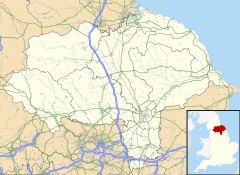 Middlesbrough ( i/ˈmɪdəlzbrə/ MID-əlz-brə) is a lairge industrial toun situatit on the sooth bank o the River Tees in North Yorkshire, Ingland. ↑ "2011 Census – Built-up areas". ONS. Retrieved 1 May 2015. This page wis last eeditit on 20 Juin 2017, at 00:12.